-Supported Codes: UPC-A，UPC-E，EAN-13，EAN-8，ISBN/ISSN code 39，Codabar，Interleave 25，Industrial 25，Matrix 25，Code 128，Code 93，Code 11，MSI/PIESSEY，UK/PLESSEY，UCC/EAN128,etc. 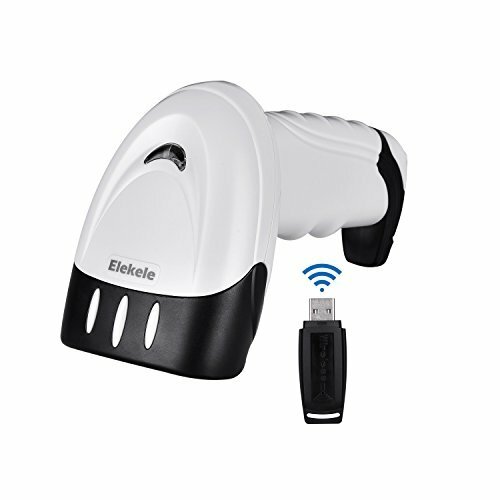 【USB 2.0 Wired + 2.4GHz Wireless Mode】Convenient access wherever you go, enjoy wireless freedom with long-range Bluetooth connection of 164 ft (50m) with super anti-interference ability. Easy to switch between wired and wireless by scanning bar code(included). 【32-Bit ARM Processor】Provides fast, precise decoding for 1d barcodes including barcodes that are 3mm in size, can read incomplete fuzzy code, stable quality. High precision scanning with a low-bit error rate and consistent quality performance during repeated, long term use makes work easier and more efficient. Support English /French /German/ Italian /Spanish. 【Support a Variety of Scanning Methods】Support Manual scanning ,Auto Scanning, Auto continuous scanning and so on, function settings only need to scan code(included) can be easily achieved. Built-in 750mA Li-battery, standby time is long to 3 months. Automatically enter sleep mode when not in use, more environmental friendly. 【Durable Protection】The key parts are made of high elastic engineering shock rubber with high friction, effective resistance to external pressure, protect the device against falls. The lifespan of the high rebound button is long to 5,0000,000 times. 【Easy to Use】No need install drive, plug and play. Support Windows XP / Win7 / Win8 / Win10，MAC OS,Google Android, linux.